The purpose of this paper is to draw attention to and highlight some particularly enlightening arguments described by Rosenberg and Schwartz (2019). First, I emphasize the importance of the role of culture in ethical analysis and describe how the Behavior Analyst Certification Board (BACB) Professional and Ethical Compliance Code for Behavior Analysts (2014; hereafter referred to as the BACB Code) unintentionally underplays the importance of culture. Second, I express support for the model of ethical analysis proposed by Rosenberg and Schwartz and explain how their model provides an excellent and much-needed framework for the observation (and subsequent study) of ethical decision-making in behavior-analytic practice. Finally, I go all in and join Rosenberg and Schwartz in their call for scholars to critically analyze and discuss the BACB Code and to challenge the status quo (or call into question those who do). Such a discussion is healthy for our science and understanding of ethics and behavior analysis. Baer, D. M., Wolf, M. M., & Risley, T. R. (1968). Some current dimensions of applied behavior analysis. Journal of Applied Behavior Analysis, 1, 91–97. https://doi.org/10.1901/jaba.1968.1-91. Beaulieu, L., Addington, J., & Almeida, D. (2018). Behavior analysts’ training and practices regarding cultural diversity: The case for culturally competent care. Behavior Analysis in Practice. Advance online publication. https://doi.org/10.1007/s40617-018-00313-6. Behavior Analyst Certification Board. (2012). Fourth Edition Task List. Retrieved from https://www.bacb.com/wp-content/uploads/2017/09/160101-BCBA-BCaBA-task-list-fourth-edition-english.pdf. Behavior Analyst Certification Board. (2014). Professional and ethical compliance code for behavior analysts. Retrieved from https://bacb.com/ethics-code/. Bolling, M. T. (2002). Research and representation: A conundrum for behavior analysts. Behavior and Social Issues, 12, 19–28. https://doi.org/10.5210/bsi.v12i1.76. Brodhead, M. T. (2015). Maintaining professional relationships in an interdisciplinary setting: Strategies for navigating nonbehavioral treatment recommendations for individuals with autism. Behavior Analysis in Practice, 8, 70–78. https://doi.org/10.1007/s40617-015-0042-7. Brodhead, M. T., Durán, L., & Bloom, S. E. (2014). Cultural and linguistic diversity in recent verbal behavior research on individuals with disabilities: A review and implications for research and practice. The Analysis of Verbal Behavior, 30, 75–86. https://doi.org/10.1007/s40616-014-0009-8. Brodhead, M. T., Quigley, S. P., & Cox, D. J. (2018b). How to identify ethical organizations prior to employment. Behavior Analysis in Practice, 11, 165–173. https://doi.org/10.1007/s40617-018-0235-y. Geiger, K. B., Carr, J. E., & LeBlanc, L. A. (2010). Function-based treatments for escape-maintained problem behavior: A treatment selection model for practicing behavior analysts. Behavior Analysis in Practice, 3, 22–32. https://doi.org/10.1007/BF03391755. Graber, A., & Graber, J. E. (2018). 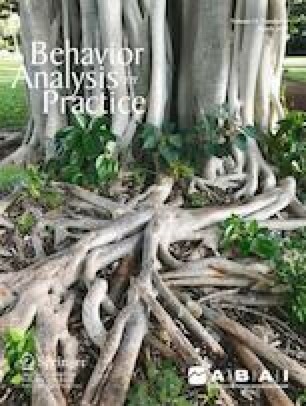 The unique challenge of articulating the behavior analysts’ ethical obligations and the case of punishment. Behavior Analysis in Practice. Advance online publication. https://doi.org/10.1007/s40617-018-00310-9. Graber, A., & O’Brien, M. (2018). The promise of accountable care organizations: “The Code,” reimbursement, and an ethical no-win situation for behavior analysts. Behavior Analysis in Practice. Advance online publication. https://doi.org/10.1007/s40617-018-0209-0. Kipfmiller, K. J., Brodhead, M. T., Wolfe, K., Lalonde, K., Sipila, E. S., Bak, M. Y. S., & Fisher, M. H. (2019). Training front-line employees to conduct visual analysis using a clinical decision-making model. Journal of Behavioral Education. Advance online publication. https://doi.org/10.1007/s10864-018-09318-1. Li, A., Wallace, L., Ehrhardt, K. E., & Poling, A. (2017). Reporting participant characteristics in intervention articles published in five behavior-analytic journals, 2013–2015. Behavior Analysis: Research and Practice, 17, 84–91. https://doi.org/10.1037/bar0000071. Newhouse-Oisten, M. K., Peck, K. M., Conway, A. A., & Frieder, J. E. (2017). Ethical considerations for interdisciplinary collaboration with prescribing professionals. Behavior Analysis in Practice, 10, 145–153. https://doi.org/10.1007/s40617-017-0184-x. Rosenberg, N., & Schwartz, I. (2019). Guidance or compliance: What makes an ethical behavior analyst? Behavior Analysis in Practice. https://doi.org/10.1007/s40617-018-00287-5. Sugai, G., O’Keeffe, B. V., & Fallon, L. M. (2012). A contextual consideration of culture and school-wide positive behavior support. Journal of Positive Behavior Interventions, 14, 197–208. https://doi.org/10.1177/1098300712442242. Witts, B. N., Brodhead, M. T., Adlington, L. A., & Barron, D. (2018). Behavior analysts accept gifts during practice: So now what? Behavior Analysis: Research and Practice. Advance online publication. https://doi.org/10.1037/bar0000117. World Health Organization. (2000). General guidelines for methodologies on research and evaluation of traditional medicine. Retrieved on January 17, 2019, from whqlibdoc.who.int/hq/2000/WHO_EDM_TRM_2000.1.pdf.